Football fans love to relive thrilling moments—winning or equalising goals from tournaments such as the UEFA Champions League, for example. These memorable moments provide highly engaging visual content that can benefit sponsors far beyond matchday. Previously, fans could typically only relive these experiences via static snapshots. For sponsors of touchpoints such as LED perimeter boards, reaping the benefit of still images means relying on luck that their brand logos are at the right place and at the right time. 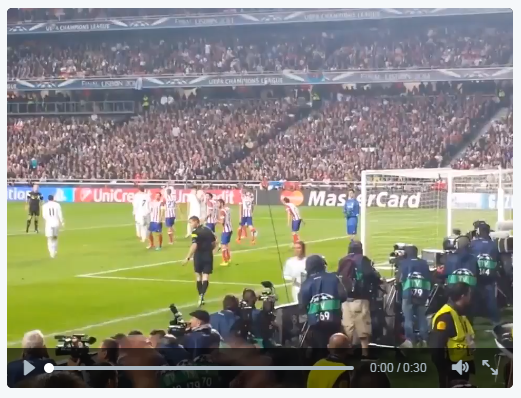 Video shared on social media is helping sponsors overcome this hurdle, particularly footage shot by fans in-stadia. These highly engaging videos provide a new perspective: the fan view. SnapRapid’s technology tracks sponsorship, perimeter fence advertising, and brand value through video as well as imagery. With video sharing vastly on the rise, it’s set to become a lucrative market for sponsors, brands and SnapRapid as we track and analyse vast digital data. One prominent example is a 30-second clip of Sergio Ramos’ equalising stoppage time header during Real Madrid’s thrilling 2014 Champions League final victory over rivals Atletico Madrid. Whilst the video is from two seasons ago, it continues to make the rounds and generate high engagement. The smartphone footage places the viewer amongst the fans. The video spans the entire length and width of the pitch as it follows Luka Modric setting up his corner kick, followed by Ramos’ header. Almost all perimeter board sponsors are visible, which could not have been achieved by TV cameramen or photojournalists, the backs of whom can be seen in the video. MasterCard benefits in particular, as it directly across from the filming fan. Furthermore, the MasterCard logo receives excellent exposure from the video’s thumbnail. It is crucial that brands recognise fans’ contribution to their sponsorship ROI, which means tracking fan generated videos and engaging those that love to relive the thrilling moments. This is precisely what we at SnapRapid do so well.